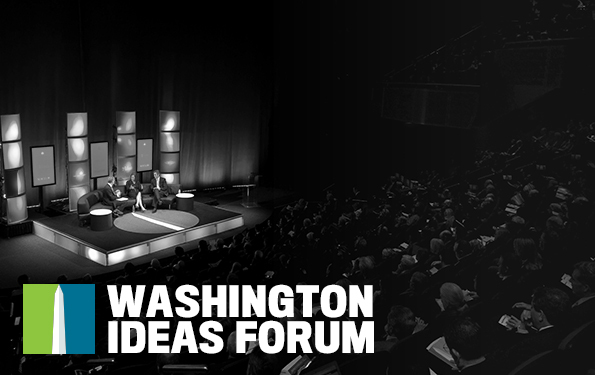 The Atlantic Monthly and the Aspen Institute recently hosted the Washington Ideas Forum at the Annenberg Theatre, located inside the Newseum. The event featured quite a few marquee names in federal policymaking, including House Minority Leader Nancy Pelosi (D-CA), Arizona Senator John McCain (R-AZ), White House advisor Gene Sperling and former Federal Reserve Chairman Alan Greenspan. The agenda read like an all-star roster from the Sunday talk show circuit. But in my mind, the real stars of the event were the young entrepreneurs and civic leaders who are ditching the establishment way of doing things in favor of getting things done. Take for example New Orleans Mayor Mitch Landrieu, who is fighting to change the landscape of the worst streets in his city; and Sen. Sheldon Whitehouse (D-RI) and Delaware Gov. Jack Markell, who won’t give up on talking about climate change on the floor of the Senate even though most Senators aren’t listening. In the business world, young CEOs are bucking the hotel and taxi industries with innovative new businesses – Nate Blecharczyk, the CTO of Airbnb, and Travis Kalanick, CEO of Uber. Their businesses have seen tremendous demand – and have built a following of what could only be described as “brand evangels” – but they’ve faced their share of red tape and pushback from government entities who are used to doing things their way, which means having a taxicab commission and collecting tax on hotel rooms. It was a privilege to get to hear such great insights and perspective from these inspiring minds. But the main takeaway I got from this event was that from a governing perspective, the “old way” of doing things isn’t going to work. There is a need for a responsive policy and legislative system that can move away from top-down bureaucracy and more toward responding to the technology innovative, crowd-sourced entrepreneurial world that is changing the face of business — and culture — at a rapid pace. It’s time for the old concerns about politics and tradition to give way to more willingness to explore different ways of getting things done. The U.S. has always been home to an entrepreneurial culture and an innovative spirit, but today’s interconnected and technologically oriented culture means that things take flight faster than ever. Ideas are hatched and launched with speed and fervor. Good ones take hold. The best ones are responsive to their consumers’ and users’ needs — and they adjust accordingly, as rapidly as possible. This isn’t a new idea in business, but it’s certainly one that makes a difference in a company’s life span. Likewise, government could take some cues from that type of rapid response. If we want a truly evolving, growing and flexible economy, the policies governing it must also be able to evolve, grow, and bend when necessary. Tradition has its place, and this isn’t to say that everything we’ve done up to this point is the wrong way of doing things. But to truly compete and keep the U.S. on top of a fast-moving global economy, we need more folks who are committed to doing things differently – and not just giving in to the old way simply because “it’s the way things have always been done.” It was an amazing experience to hear so many great perspectives, insights, and ideas, but what I really hope is that many of those can shift from the confines of the mind to a state of tangible reality.